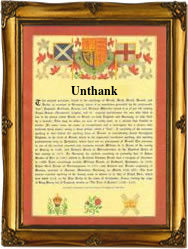 Recorded as Unthank and sometimes Onthank, this is a most unusual and rare English surname. It has nothing to do with not thanking somebody, but is locational. It originates from three villages called Unthank, two in Cumbria, the other in the neighbouring county of Northumberland, on the Scottish border. According to the Oxford Directory of English Place Names, the place and hence the surname derives from a pre 7th century Olde English word "unpance" which means literally "without leave," and described an area of land which was occupied unlawfully. If this was the case it seems strange that the powerful landowners of the time did not trouble themselves to remove these interlopers, before the places became established, but clearly they did not. This suggests that since the villages were in an area of continual dispute between the English and the Scots, it may have suited the overlords perhaps the famous Percy family, to leave well alone, particularly if the villagers gave allegiance to them. All three places were first recorded about the year 1200, just about in time for four hundred years of strife, before the accession of James V1 of Scotland to the throne of England in 1603. After that with unification, peace gradually returned to the area. The first recording is probably that of William de Unthanc in the History of Northumberland in 1233, with Richard de Unthank in the Hundred Rolls of Landowners of Cumberland in 1273, and Henry Onthanke who married Margery Maye, in London, in 1577.